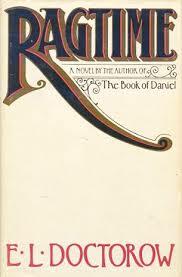 Back in 1975 this was a genre changing book and I think historical fiction was never quite the same again. I read it when it was newly released – 1975 or so, and absolutely loved it – I loved the playfulness of it and the era of the history. I didn’t really pay too much attention to the details of the plot but still, it shot up and stayed one of my all time favorite historical fictions for many many years – even now, perhaps. When my home and books burned to the ground in 1991, this is one of the dozen or so books I actually replaced. cover of the original -and this is one of the books I replaced although didn’t reread. Now the 20th Century Reading Group (Yahoo Group) scheduled it for an April discussion and although I sometimes pass on rereading old favorite books (what if they don’t hold up?) I took a chance with this one. The setting is basically the US and Europe from the end of the Gilded age or so until WWI – 1902- 1914 or so. That’s a fascinating time and interesting that I just read Doris Kearn Goodwin’s The Bully Pulpit in February. That made for a fine review of the political aspects – the Progressive Era presidents, Teddy Roosevelt and William Taft, the muckrakers, the trusts, the immigrants, etc. Besides this era worldwide with it’s huge technological changes is just fascinating to me, film, autos, telephones – celebrity. 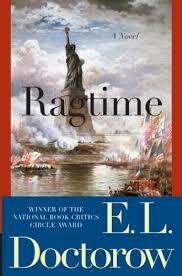 Ragtime follows several narrative developments or plot threads which impact the lives of a completely fictional upper middle-class family in New Rochelle, NY. There’s a second fictional family comprised of a Jewish immigrant paper cutter, Tatah, and his young daughter who live in deep poverty. On the nonfiction side there’s the Evelyn Nesbit thread with the trial of Harry Thaw for murdering Sanford White. There’s Harry Houdini and his career in escape. There’s Commander Perry, the North Pole adventure and the Esquimos. There’s J.P. Morgan and Henry Ford and many, many other characters from the pages of history. NOT everything that is written about them in Ragtime is true – this is obvious from the idea that Carl Jung and Sigmund Freud would go through the Tunnel of Love together. Metaphor imo – great metaphor. The whole mix makes for a researcher’s delight and it also provides a kind of theme to some – where is the line between truth and fiction. That’s probably a huge theme -both the fictional and fictionalized characters are believing a lot of nonsense, the newspapers are printing a lot of nonsense – who believes what? But I’ve not found any satisfaction from that theme for a long, long time so for this reading I’ll go with another idea and say that the mix of fiction and verifiable fact is to more accurately depict the social history of the times. Racism is a huge topic or motif, as is unionization, the celebrity status of some due to the sensationalist journalism, the rich vs poor and socialism, the occult and more. There is another idea which is replayed in various ways several times- that is the burying of people and things under the dirt or water – Houdini really wants to escape from a grave, the soldier is shot out from under a lot of dirt, a baby is found under a pile of dirt in the garden, the kids at the beach bury each other in sand, Morgan spends the night in a pyramid. On the water side, the Lusitania is sunk and the car is brought up out of the river and restored. So many things are buried? Reborn? Finally, books about this era have always attracted me and this has the same qualities I found in Dreamland by Kevin Baker and Winter’s Tale by Mark Helprin – maybe even The Electric Michelangelo by Sarah Hall. All three feature the same sense of amazement and delight, hardship and inequity, the life of people, real, imagined and a bit of both, trying to navigate the world as it changes around them.